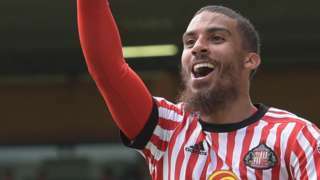 Lewis Grabban scores twice for Sunderland and also nets an own goal as the Black Cats beat Norwich 3-1 at Carrow Road. That's it from the Local Live team for this week, so goodbye and enjoy the weekend whatever the weather brings us. We'll be back from 08:00 on Monday, bringing you the news, sport, travel and weather updates as they happen. Police want to trace three men seen around woodland close to the time Peter Wrighton died. The weather for this evening and tonight will be mainly dry at first across the BBC East region, but cloud thickening from the west will bring the chance of some patchy light rain. There will be light to moderate southwesterly winds, which will turn more westerly later. The temperature will dip to 13-15C (upper 50sF). Tomorrow it will mainly dry with a mixture of sunny spells and patchy cloud, but thicker cloud could bring one or two isolated showers, mainly across Norfolk. Highs around 20-22C (near 70F). 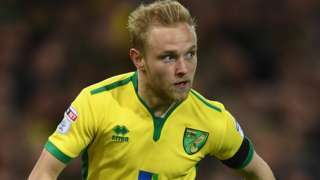 Norwich midfielder Alex Pritchard is to have an ankle operation and will be out of action for up to 12 weeks. 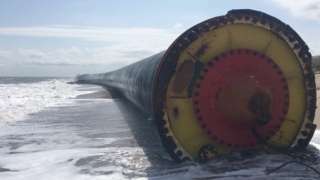 Four pipes washed up on beaches in Norfolk, while eight more have been "secured" at sea. Some 83 years ago this month a party of holidaymakers were caught on camera enjoying a thrilling trip in a speedboat at Great Yarmouth. Giant Lego animal invasion alert! Enormous birds and animals have invaded a nature reserve on the Cambridgeshire and Norfolk border. But don't panic... they're made of Lego and are currently touring all Wildfowl & Wetlands Trust reserves in the UK. At the moment they're at Welney in The Fens and they're staying there until 3 September. As well as this massive 1.5m (5ft) frog, there's a Bewick's swan, an emperor dragonfly, a kingfisher, an otter and more. Watch this timelapse video below to see how they were made or pop along to Welney and see them in the flesh, so to speak. The Vicar of Banham says the community wants to support the family of a man killed in a frenzied knife attack. 83-year-old Peter Wrighton (pictured) from the village was murdered while walking his dogs last Saturday morning near East Harling on the edge of Thetford Forest. CCTV shows him at Kenninghall Post Office at 10:10 - just half an hour before his body was found at Harling Woods. 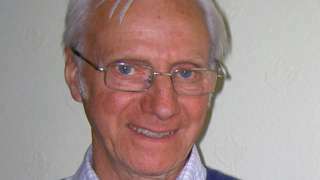 The Reverend Canon Stephen Wright says people would like to hold a special service for him, but it's up to his family if it goes ahead. "People are shaken. There is so much unknown at the moment," he said. "We don't want to intrude on their grief, but if there is anything we can do to help, we will help." Concerns are also raised about food hygiene and a rat infestation at HMP Norwich. More residents of Attleborough are being urged to give their views on major improvements in the town centre. Barely 100 people so far have made their voices heard on the £4.5m proposals. Norfolk County Council won the funding for road and transport improvements and earlier in the year initial proposals were published showing how the money would be spent in Attleborough. It includes making Surrogate Street open to two-way traffic and making other roads in the town safer for pedestrians to cross. Councillors say only 95 responses have been received so far. They want to be sure the plans are fine-tuned to meet everyone's needs. The deadline for responses to the county council is midnight on Sunday. Sunshine this morning will give way to cloud and rain this evening across the BBC East region. The weekend will be cloudy, but dry with temperatures peaking at 20C (68F). There's to be a two-week inquest into the death of a man from Lowestoft - after an accident on a platform in the North Sea. Tyron Jones, 43, died in December last year at the Norfolk & Norwich Hospital after being flown from the Indefatigable 23A gas platform about 70 miles (110km) off the coast. The full inquest will begin on 6 December - a day after the anniversary of his death. The Norfolk-based sports car maker Lotus is back in the black after years of heavy losses.. The company, which was recently bought by a Chinese firm, made a profit of £2m last year after a rise in exports to Europe and America. Lotus, based in Hethel, near Wymondham, said it was now on a sustainable path, for the first time in years. Norwich City have been drawn to play against Charlton at Carrow Road in the second round of the Carabao Cup (aka the League Cup). That wasn't after confusion however - a mix up with the balls during the draw meant that initially the game was announced to be played at The Valley. However, it was changed to be played at Carrow Road soon after. The Canaries progressed into this round of the cup after beating League Two side Swindon Town on Tuesday. The game will be played on the week commencing Mon, 21 August. It's due to be dry and sunny for most of the day, but there's a chance of it becoming cloudier later this afternoon with some patchy rain coming in from the west. For a full forecast where you are, visit BBC Weather. Welcome back to Local Live across Norfolk. We'll be here until 18:00 with the latest news, sport, weather and travel updates for your area. The full weather forecast will be with you shortly, but it's another grey start to the day. As always, if you want to get in touch you can by email, Facebook or Twitter.